Lightspeed Link. At the heart of Tango is Lightspeed Link. Developed by Lightspeed engineers to ensure the reliable communication pilots demand, Lightspeed Link is not Bluetooth or WiFi, but incorporates existing technologies chosen for both signal reliability and audio quality for the aviation environment. 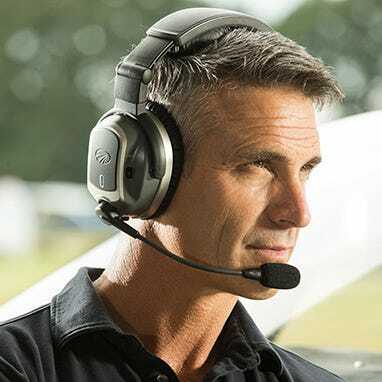 The Lightspeed Link connection is so robust, as many as six Tango headsets can be operated in the same aircraft, letting everyone onboard experience the true freedom of wireless flight. Panel interface. The panel interface is the vital hub of the Lightspeed Link system, routing communication between the headset, the intercom, and auxiliary devices. Wrapped in an attractive and durable case, it houses the lower cable, which is adjustable to 31 inches. Weighing just under 9 ounces and with multiple mounting points, no upper cables, and critical controls located on the headset, the panel interface can be mounted conveniently and securely in any aircraft. 21st-century power. In yet another Lightspeed first, Tango is the first aviation headset powered by rechargeable lithium-ion batteries, a power source trusted in countless critical applications. Lightspeed's rechargeable lithium-ion batteries deliver twelve hours of continuous operation while offering earth and wallet-friendly reusability in a compact size. Battery Life. Tango offers a 12-hour battery life, with lithium ion rechargeable batteries in the left earcup and the back of the panel interface. In a thoughtful touch, these two batteries are interchangeable, so you don't have to worry about keeping them separate. Charging. The Tango dual-port wall charger can quickly charge both the headset and panel interface batteries at the same time, providing 70% charge in less than an hour and a full charge in two hours. The batteries can also be charged while the headset is in use or easily replaced on the go. The batteries for the headset and panel interface are interchangeable, and spare batteries can be purchased separately. Built-in redundancy. 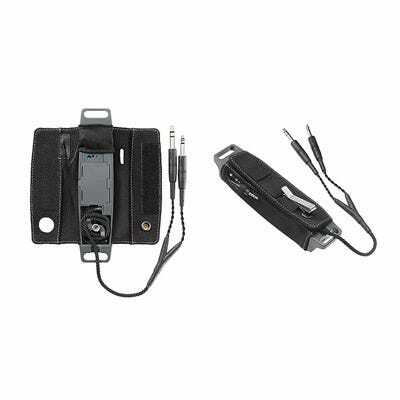 The panel interface also stores the backup cable, instantly available for uninterrupted communication, in the event the batteries become depleted. Active Noise Reduction. Outstanding quiet Tango delivers the advanced noise cancellation you expect from Lightspeed. Remarkable comfort. Tango features plush ear seals with large openings and nearly 10 square inches of surface area for a better seal and greater distribution of side pressure. Made in the USA. Performance. Lightspeed’s commitment to innovation and continuous personal engagement with customers are the drivers behind their industry-leading performance and a long list of industry firsts and Lightspeed exclusives. 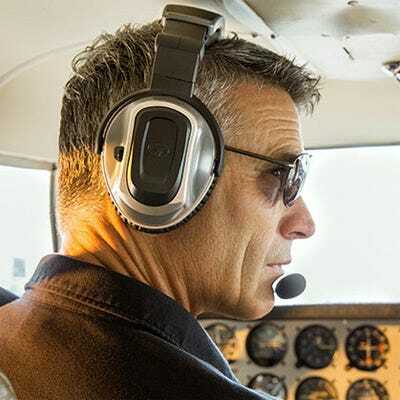 Famous for bringing new features to the aviation market, Lightspeed was the first aviation headset company to offer intercom priority, automatic ANR shut-off and integrated Bluetooth cell phone and music. 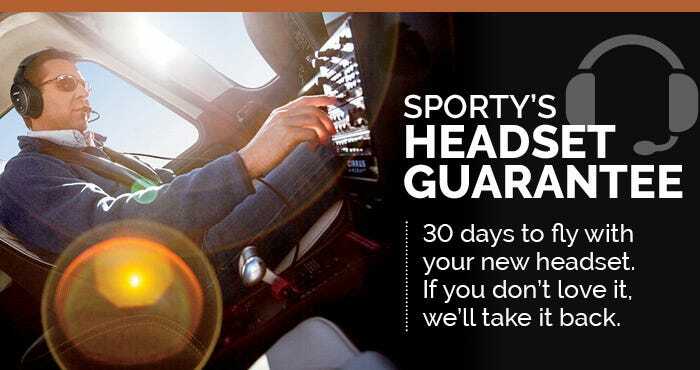 Their innovation continues today, with a host of features exclusive to Lightspeed headsets. A wireless headset, a firmware-upgradeable headset and app integration with a headset are just a few of the exclusive features you will find only in Lightspeed headsets. Value. 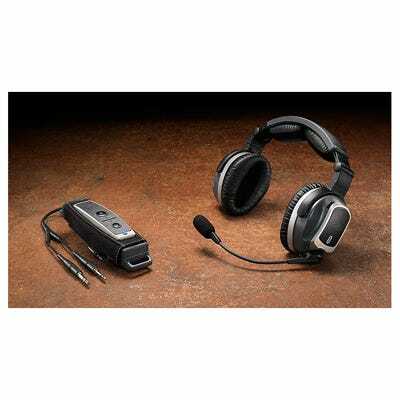 Dollar for dollar, Lightspeed products offer higher performance and more features than any other headset on the market. Your investment in a Lightspeed product yields returns that will exceed your expectations. Support. Lightspeed’s customer support goes beyond response times and customer-oriented solutions. It also means engaging with thousands of customers every year –– in person –– to understand how and why they fly and doing their part to help the aviation community thrive. Choice. 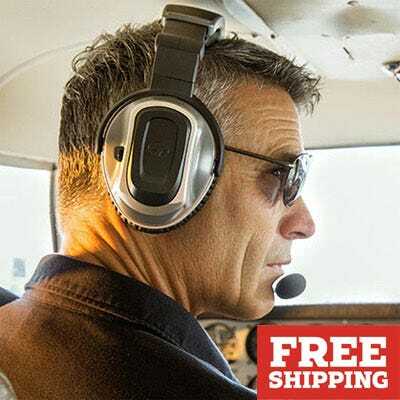 Lightspeed understands every pilot, plane, and mission is different and offers a full line of premium headsets so pilots may choose which suits them best. "One of the most popular questions that we used to get was, "When will there be a good wireless headset?" Finally, we can say that the Lightspeed has done it. 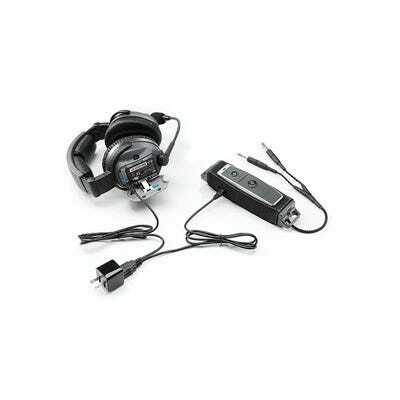 The Lightspeed Tango headset is a great quality ANR headset with all the premium features you'd expect PLUS wireless technology. We love that it's the familiar Sierra style platform for comfort but adds all the best features pilots want without cables." Battery powered, twin plugs - this is by far the most common style, with separate microphone and headphone plugs (so-called PJ plugs). Almost every airplane ever built has these two plugs in the panel, so these headsets are universal. The only downside is that, for ANR headsets, you will need to use batteries to power the headset. Aircraft powered, 6-pin plug - the second most popular style, sometimes called the "LEMO plug," requires no batteries since it is powered by the panel. This is convenient, but it does require the 6-pin plug to be installed in the panel. While many newer airplanes come with this option, most older airplanes do not. For these applications, you'll need to have your avionics shop wire in the plug - not a big job, but not something pilots can do on their own. Helicopter plug - helicopters use a single, shorter plug (that is not compatible with airplanes). This is not like the 6-pin plug above, however, since an ANR helicopter headset will still need batteries. The only confusing part is that some helicopters also have a 6-pin (or LEMO) plug. In these helicopters, there are two different single plug connections. When in doubt, we recommend buying the battery powered, twin plug model. This is the most universal option, and will work in almost any airplane. If you have a 6-pin plug in your airplane or you plan to install one, the aircraft powered model is a nice option. Thanks Sporty's for the easy return. This headset is bulky, has too many unlabeled buttons, and will require frequent battery changes d2 bluetooth usage, in my humble opinion. However the Lightspeed Zulu headset is great. I think I got what I expected: the wireless feature is really worth the other aspects in which this headset is wanting (durability and ease of use) which, by the way are, not at all hard to overcome... just have to be extra careful with the headset and get use to the non so intuitive handling. 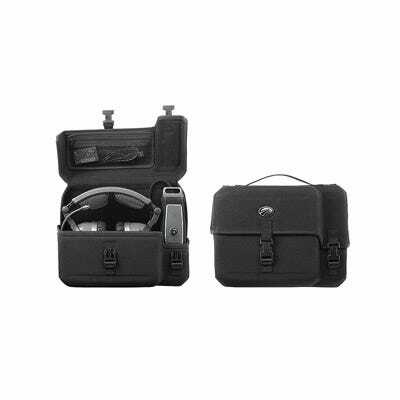 On the durability aspect, a nice compensation is the fancy and tough case included with the headset. When out of the cockpit is more than enough to protect the device, even against some tough handling. Performance wise is great: very comfortable, good noise canceling, and great acoustics in and out. Weight is not at all an issue. Nothing not already commented in most of these reviews. Owned for two years, traded it for a Zulu 3. I recently read another review complaining about Lightspeed's customer service being poor. I have to completely disagree! But I'll get to that... In summary, just get a Zulu 3. I don't think the wireless feature is worth the inherent problems of the rechargeable lithium ion batteries. And I don't think the Tango is built to quite the same quality as the Zulu 3. I had been using Tango for just over two years now, and for the most part, I haven't many issues. The ANR is good, and its comfortable. I liked not having cables coming up form the control module to my head. 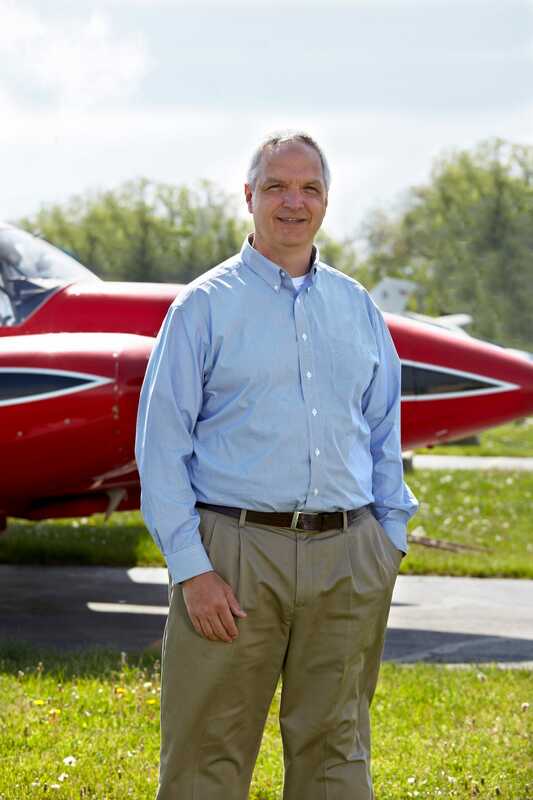 I wore it on a long cross country in a single engine piston for over 9 hours of flight time in one day, and it worked just as advertised and didn't cause any headaches. After about 9 months, I noticed that one of the hinges was starting break and come apart. I actually noticed this while at OSH and I took it to their booth. I got one of the sales reps business cards, and sent an email when I got home. She arranged for the warranty repair and I shipped it away, having only paid for my shipping. They paid the return shipping, and I don't remember exactly how long it took, but I'd say it took less than two weeks to come back looking brand new. Now, two years in, my batteries are starting to no longer hold a charge. The batteries are $35 a piece and there are two of them, so I would probably spend less in AA's every two years running a Zulu (though I'm speculating). The battery failing led to a hectic situation one night on a IFR flight setting up for an approach while single pilot and no autopilot in marginal VFR conditions (I know, should have mitigated risk better). The headset cut out mid transmission. I turned it back on and it quit a few seconds later so I reached for the back up cable on the control module. The backup cable became tangled inside of the control module and wouldn't free itself. I unhooked it from the side pocket and started to take apart the canvas covering. I finally got it untangled, plugged in and finished the flight with horrible sound quality and little passive noise reduction with the module sitting in my lap because I couldn't get it back together again and attached to the side pocket. This has left a pretty bad taste in my mouth, to say the least, and I no longer want to rely on this headset. I knew they have some trade up program on their website, so I went to look for it, but found that the Tango was not eligible to be traded for anything. So I sent them an email and explained what happened and how I wanted to trade for a Zulu 3. The lady told my that while they don't normally trade in the Tangos, she would work with me. So they have sent me a Zulu 3 and I am sending them my Tango. I am paying for my shipping and the $50 difference between the retail price of the two headsets. I'm thrilled that they worked with me here because I was tempted to try to sell it on eBay for what ever I could get and pony up the rest for a Zulu 3. Or possibly even an A20. So as I said before, I wouldn't recommend The Tango. I had probably the worst thing possible have at the worst possible time. The A20 is nice, though I haven't used it extensively, I found it a little more comfortable than the Tango. I just couldn't justify the $300 or so more for the Bluetooth version of the A20. Some other thoughts: The headset style is not like the Zulu. The flatter top and two hinges are different, and they're not bad, but that lead to one of the hinges breaking (compare the picutures between the Zulu and the Tango, and you'll see what I mean). There is no hinge to break on the Zulu. My next point is that the carrying case offers very little protection. The hinge may very well have broken from being dropped in the case, but I'm not sure as I didn't notice it right away. I thought Tango would reduce the cluster of wires in my cockpit, and it has done that a little, but there are still wires to be dealt with because the sending unit has a rather long wire that can be partially, but not completely, stowed. On my second flight, there was so much static ( interference, maybe?) that I had to switch back to my old headset. Could be I hadn’t charged the batteries enough to start with. Since then it has worked well except for a constant echo, but only in my headset-no one else can hear it. Also can’t get it to pair with my iPhone but that could be a problem with the phone. Disappointed with Lightspeed customer service. I have had the headset for about a month now and made five flights with it. I love the fact that it doesn’t have any wires which gives me freedom of movement. I do have an issue with the pad that sits on top of your head. It fell out and will not stay in. I called lightspeed customer service and they kind of blew me off and said the tabs must be broken off the end of it or something and wanted me to buy a replacement. There is nothing broken on it and I offered to send them a photo of it but they didn’t seem interested in looking at it. I will probably just put some double faced tape on it to hold it in place but don’t think I should have to do that with a brand new $800 headset. There does seem to be some echoing in the audio that I hear in the headset. It's a very good idea, and as other Lightspeedheadsets I used have been good products I really hoped this would be good. BUT, it's VERY porly designed!! It feels lke a cheap Chines knckoff item. Both head set and control unit is very big. Our headset broke after afew week of use, a cable on the head band broke. The chargeing port cover is terrible, it's impossible to get it to stay closed. ANR function is ok, but the audio in it is very poor. I am in doubt between Bose A20 and LS Tango, which of these two has the best ANR Cancellation for Helicopter Noise? BEST ANSWER: TSO is a Technical Standard Order. It is standards for the material and construction of an item. Will the lightspeed tango fit into a crosswind flight bag's headset pocket? Will the standard charger work with 240V socket? BEST ANSWER: The standard Charger is 110V. You would need a converter. can you over charge batterys ? BEST ANSWER: No, The charger has built-in overcharging protection. BEST ANSWER: The tango's connection is a twin plug, We do have a twin plug to airbus adapter. BEST ANSWER: The Tango headset has a 5 year warranty. Do I have to buy a battery charger for my tango headset?? BEST ANSWER: No, the battery charger is included. Does this product has warrantee? Is the panel unit conducive to moving from aircraft to aircraft? The description seems to imply the panel unit needs to be permanently installed. Not very compatible with a CFI lifestyle. BEST ANSWER: The unit is like any other headset. It is connected to the intercom via the GA style plugs and is portable. BEST ANSWER: The LEMO plug is a six pin connector for the headset. It allows the headset's ANR to be powered via the ships power instead of batteries. This is the case for all but the Tango headset. The Tango because it is wireless still required the batteries on the headset. The box that connects to the panel would be powered by the ship's power. Does Lightspeed offer a CFI rebate like Bose does? BEST ANSWER: Yes, please go to lightspeedaviation.com. Under the company tab are the directions for their CFI Program. 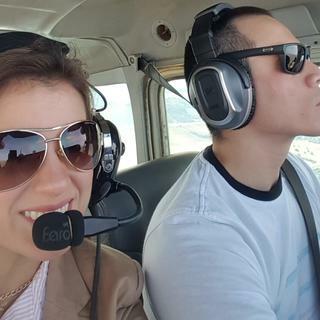 Can you talk to another pilot in cockpit with same headset in aircraft not equiped with intercom? BEST ANSWER: The Tango headset has a communication box that plug in just like a regular headset. You can use up to 6 Tango headsets together in the same aircraft but each must be plugged into the intercom. Since you need batteries in both sections, is there any real value for the LEMO plug? BEST ANSWER: Yes this comes in a LEMO plug. The headset would need the batteries but the control box would not. I thought that with one base unit, you could have up to 5 headsets connected. Maybe I misunderstood. Do you need to buy the base unit with each headset? BEST ANSWER: You can have multiple headsets in a single cockpit without interference, but you must have a single headset paired to a single panel unit. Is there a 12 volt charger available for the batteries?? BEST ANSWER: There is not one included. I briefly looked on google for any, and there aren't 12V DC chargers market for it. However, the output of the wall charger that comes with it is 5V and 2.4A. 5V is pretty standard for USB and only a few cell phone chargers (one Samsung model that I know of) deviate from that. So what you can do is go to best buy or amazon and just buy a 12V DC cellphone charger that is 5V and 2.4A or less. The fewer amps, the slower it will charge and too low may not even charge them at all. Too many amps, and you can damage the batteries, so keep it below 2.4A. The one I have from best buy that I keep in my truck for my cellphone actually has two USB ports so I could charge both of the headset's batteries in the airplane with it. Its a pretty cheap solution if you ever need to charge them in the airplane. I have a Zulu 2 in like new condition. Is there a trade in program for the Tango? BEST ANSWER: Not at this time, but eBay has a pretty good market for used headsets.